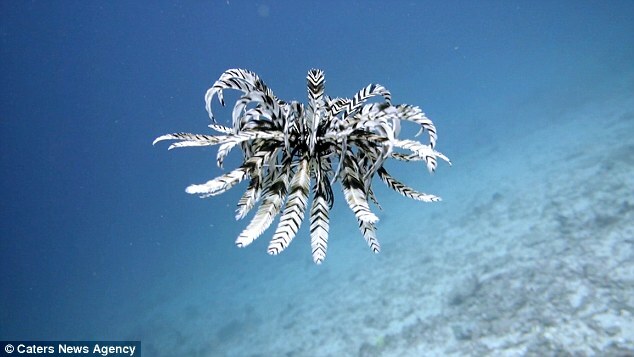 The beautiful creature, officially called a crinoid, was filmed by Dutch diver Els van den Eijnden off the coast of Bali. Crinoids are not uncommon in areas where coral grows, but they are hardly ever seen swimming. Since they are almost always found attached to rocks or coral the footage is extremely rare. In this case it appears the creature has been knocked from its base and has to swim. References to half-bird half-fish sea animals in old texts are thought to be crinoids, which belongs to the same family as star fish and sea urchins. The unusual movements mean that the video clip has now gone viral with people all over the world mesmerized by the feathered creature. 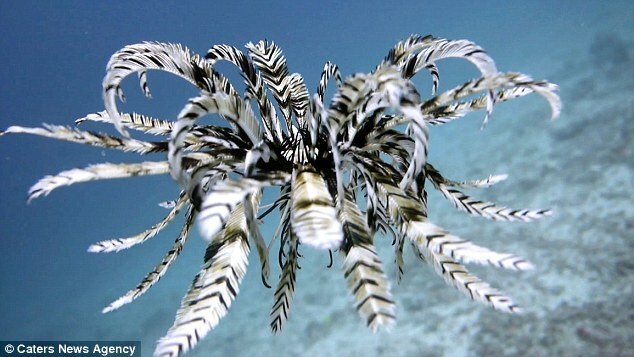 Crinoids feed by filtering small particles of food from the sea water with their feather like arms. The tube feet are covered with a sticky mucus that traps any food that floats past. Once they have caught a particle of food, the tube feet can flick it into the ambulacral groove, where the cilia are able to propel the stream of mucus towards the mouth. Generally speaking, crinoids living in environments with relatively little plankton have longer and more highly branched arms than those living in rich environments. 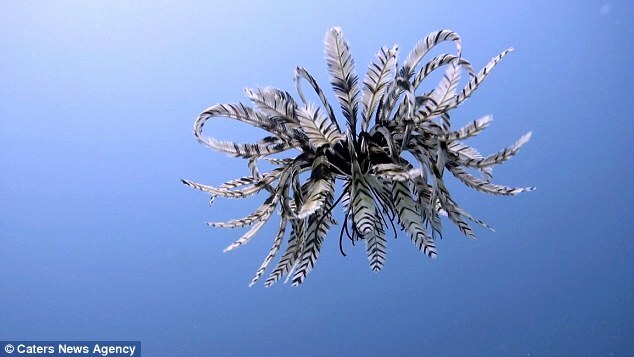 Responses to "Fascinating Feather Star Creature spotted by a diver underwater"